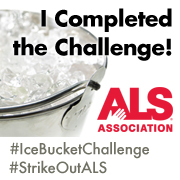 --Don’t be surprised if you walk into a store to buy a bag of ice and have someone say, “I’m dumping ice on myself later too”... read more about the ALS Ice Bucket Challenge. What! This is exactly what happened to me this evening when I went to get my ice so that I could go have a friend dump that bag of ice on me. The ALS Ice Bucket Challenge has gone viral across the United States, thanks largely to social media. According to the ALS Association, as of today they have received 53.3 million dollars in “Ice Bucket” Donations. What’s even more amazing is that in just the past week over 43 million dollars in “Ice Bucket” donations have been made. In short, Amyotrophic lateral sclerosis (ALS), often referred to as "Lou Gehrig's Disease," is a progressive neurodegenerative disease that affects nerve cells in the brain and the spinal cord. To learn more you can visit ALS.org. The ALS Ice Bucket Challenge is quite simple. Someone shoots video of themselves first acknowledging they accept, in my case, Shanna’s Ice Bucket Challenge. Then you simply specifically challenge other individuals, while your freezing to death after having ice dumped on your head to do the same. You post your video on Facebook, tagging those who you have challenged in the video. You then have 24 hours to record your own video and issue out your challenges such as I challenged one of my co-workers at Ziglin Signs, Ashley Conner, New Haven Mayor George Panhorst, Missouri Governor Jay Nixon, and retired Hall of Fame Basketball Coach Ray Steinhoff. Which I recorded the video in his backyard. I slightly modified the timeframe to 48 hours since it is a weekend. If you don’t accept the challenge the idea is for those individuals to make a donation to ALS (suggested amount is $100) if you do accept the challenge then it’s only right to still make a donation of at least $10, which I did do. To read more about this crazy phenomenon visit ALS.org/fight-als/ice-bucket-challenge where you can also make a donation. So the next time you someone buying ice, they are probably not icing down a 12-pack of Pepsi.